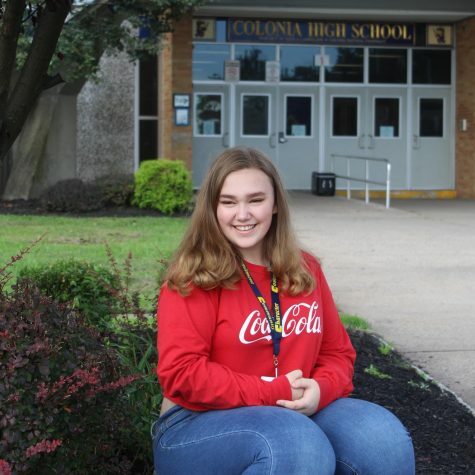 Hillary Wolanski is an 15 year old sophomore at Colonia High School. Wolanski is a new student this year coming from Delaware Valley High School in Pennsylvania. She likes to spend her free time listening to and playing music. Furthermore, she loves socializing with her friends and making new ones. Wolanski used to cheer for 3 years, but then quickly quit to pursue tennis. Her tennis life only lasted another 2 years, but sometimes she’ll still play the sport outside of school. Wolanskis life mostly surrounds around music. Next, she loves to play the ukulele and drums. In addition, she is learning piano and guitar in her spare time. Despite being very good in math, that is her least favorite subject. Her favorite subject either has to be English or French. Wolanski is still searching for a new hobby to follow. When she isn’t busy with school work, Wolanski loves to go up to Pennsylvania and visit her old friends, school, and family. As much as she misses her old life in PA, she can’t wait to start a new one in Colonia!